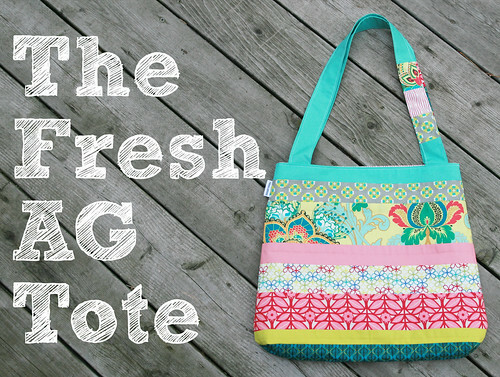 Today I'm so excited to be able to share my first project as part of the Art Gallery Fabrics Fat Quarter Gang, the Fresh AG Tote! I designed this tote with summer in mind, perfect for taking to the park or the pool. It's a simple pattern for beginner bag makers as well. You can find the pattern over on the Art Gallery Fabrics blog and also the PDF download on their pattern summary page (if you don't see it there right away, it will be there soon - just go to the blog post). Now for the giveaway! Want to win all the Art Gallery prints I used on my bag (minus the solids)? I will pick a winner Friday evening, July 27th. And don't forget to add photos of your finished project to the Fat Quarter Gang Flickr group. Happy sewing everyone! The lucky winner is #124: Martha said "Love your tote:) awesome!" Congratulations Martha! I will be emailing you for your address. Thanks for commenting everyone!